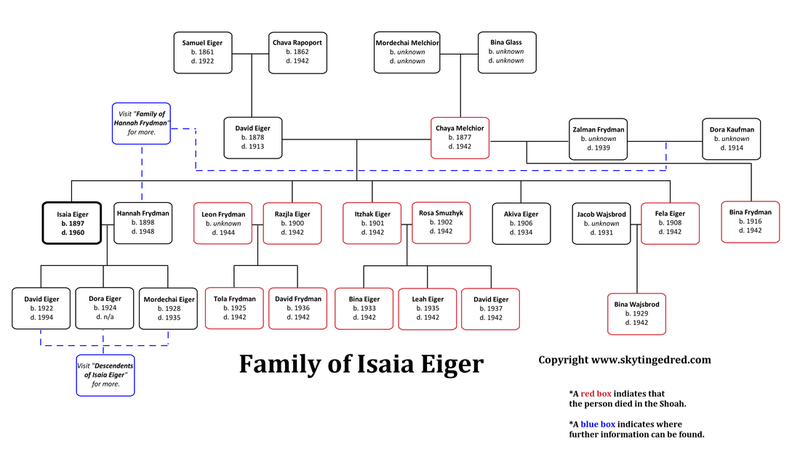 Isaia Eiger was the oldest of five children born to Chaya Melchior and David Eiger. When he was about sixteen years old his father died and soon after his mother remarried. 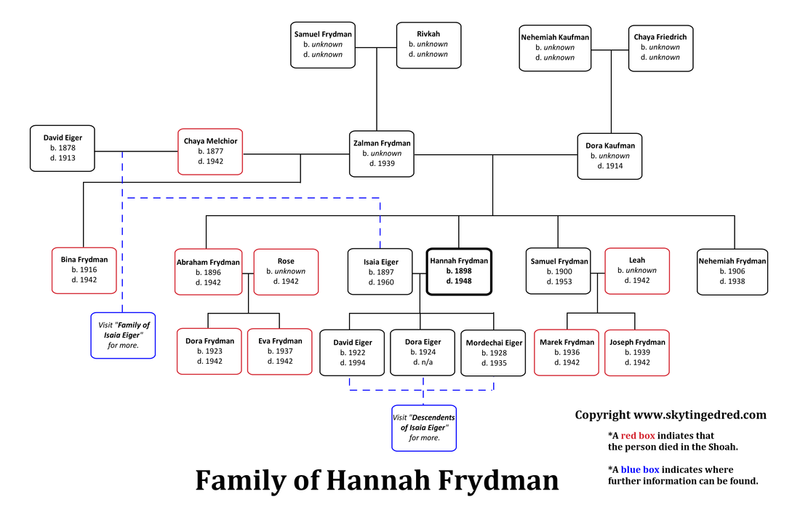 Her new husband, Zalman Joseph Frydman, was a widower with four children of his own (they later had one child together). The second oldest, and Zalman's only daughter, was Hannah Rose, a beautiful young woman nine months Isaia’s junior. Perhaps inevitably, the two teenaged step-siblings fell for each other, and they were married in 1920. Their first son, David, was born in 1922; their daughter Dora, who translated Sky Tinged Red, was born fifteen months later. In 1934, Isaia's brother Akiva fell ill and died unexpectedly at the age of 26. That same year, Isaia and Hannah Rose's youngest son, Mordechai, was diagnosed with Leukemia. He died in 1935 at the age of six. In 1938, Hannah Rose's younger brother Nechemiah died; he was 32. These premature deaths, though not all that uncommon in mid-century Europe, were tragic events that shook the entire family. In April 1941, the Germans established two ghettos in Radom, the large ghetto, which interned about 25,000 Jews and the small ghetto, which housed about 8,000. Most of Isaia and Hannah Rose's siblings and their children moved in with their mother, Chaya, who lived in an apartment on the edge of the large ghetto. Isaia and Hannah Rose and their children were assigned to a few rooms in a house on the opposite side of the large ghetto. In August 1942, the Germans began liquidating the Radom ghetto. They began with the small ghetto, and after removing all of the Jews from there, they still had room in the boxcars, so they began clearing the large ghetto. They started with the side of ghetto where Chaya and most of Isaia and Hannah Rose's siblings, nieces and nephews lived. The boxcars filled and the section of the ghetto where Hannah Rose now lived with her children (Isaia had been arrested and taken to Auschwitz several months earlier) was spared. But within two days, almost all of their siblings, step-siblings, their spouses and children were killed at Treblinka. Isaia, Hannah Rose and their two children, David and Dora, all survived the Shoah. Only one of Isaia and Hannah Rose's siblings, her brother Samuel, survived. David and Dora were the only members of their generation in the Eiger-Frydman family to survive. Today, Isaia and Hannah Rose's five grandchildren and nine great-grandchildren are the sole remnant of their once-large extended family. However, this remnant is strong and growing. They are successful actuaries, lawyers, computer engineers, financial analysts, marketing professionals, students and journalists. They are proud members of the Jewish community. And they carry forward their family's legacy with pride.